Want to have a web address that stands out and gets people to click? Consider using the .click domain. This unique extension is a quirky alternative to basic .com or .org options. The word has become synonymous with Internet culture since the computer mouse was invented. As a result, this domain is associated with technology and digital content. Whether you’re a dedicated content creator wanting to show off your latest work or you own a digital media firm that needs to create an immersive digital space, the .click domain is the way to go. This generic top-level domain was delegated by ICANN in 2014. In only a few years time, tens of thousands of websites have been registered. It has quickly become a must-have domain for tech-savvy businesses and entrepreneurs wanting to make a splash. Why Choose a .click Domain Extension? One of the biggest reasons why companies and individuals choose to utilize the .click domain is its heavy association with the digital world. Audible clicks have become the unofficial soundtrack of the digital age. It’s an important sound and action, whether or not people realize it. Why not tap into those subconscious feelings and incorporate the .click domain into your branding? While the sounds of clicking trackpads and mouses have been around for decades, the term is still associated with modern technology and art. With a unique .click domain, you establish yourself as a pioneer in your industry. You can control your overall internet presence and brand identity by conveying images of creativity, knowledge, and culture. It’s a geeky buzzword that you can use to your advantage when you’re planning, publishing, and marketing your website. The easiest way to use the .click domain is to attach it to your company name. If you have a modern name that pushes your high-tech image even further, the extension can become a big part of your brand. For example, tech companies could create a website called Byte.click. Digital creators and artists can call their website TheArtists.click. Game developers can market their web-based game with a promotional website like PlayAnd.click. The possibilities are truly endless, especially when it comes to fun domain hacking. 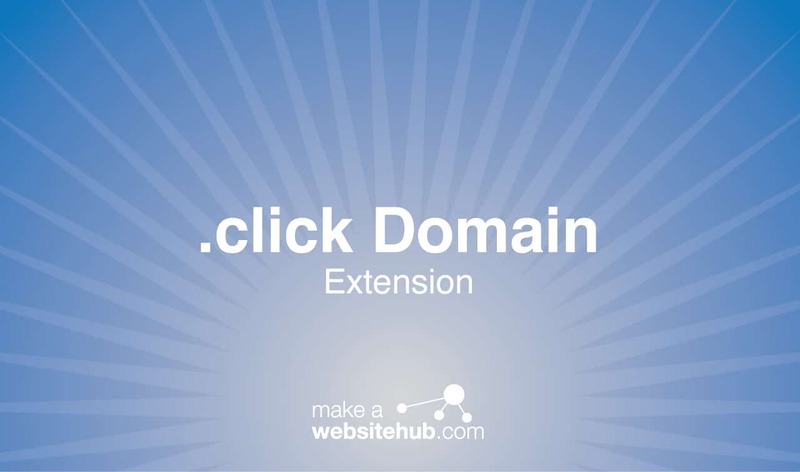 Where Can You Buy a .click Domain Extension? Despite its massive popularity, .click domains are still up for grabs. Best of all, registration fees are very affordable. This makes it accessible to organizations of any size. You can find the domain available at most domain name registration sites. Want to see if your desired name is still available? Check out these registrars. As a generic top-level domain, you don’t have to worry about major restrictions. While it belongs to ICANN’s technology category, it’s not reserved for any particular sector. There are, however, a few naming limitations. You can’t use the name of a handful of an important organization. Also, all two-letter domains are reserved for the time being. Though, they may be made available at a future date. Beyond those considerations, the .click domain is open and ready for registration. You can register your website for up to 10 years at a time.